Gaining weight is as much of a challenge as losing weight. Although it is easy to gain weight with all the junk and calorie-dense food available around you, one must aim at gaining the weight in a healthy way. Also, after gaining that weight, it is important to be able to maintain it like a pro! Once you have reached your target weight, continue following a well-balanced diet with a sufficient amount of proteins. You do not really need a protein supplement to maintain the gained weight. A good diet should be more than sufficient. Do not indulge in high-fat foods that will end up causing extra, ‘unhealthy’ weight gain. You would most probably have been put on a high-calorie diet during your weight-gain program. It is not necessary to follow that even after you have achieved your goal. You may gradually reduce your calorie consumption according to your needs and lifestyle. Talk to a health expert. Weight training should still be a part of your exercise routine. 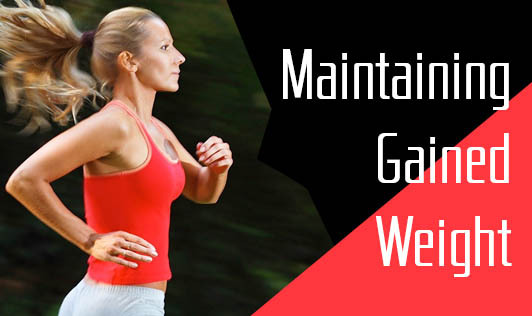 You should make physical activity a part of your lifestyle to maintain a good fitness quotient. Furthermore, it is important that you monitor your weight regularly. Maintain an exercise regimen and not to forget, keep in touch with your health expert, so that you don’t lose out on your gained weight.